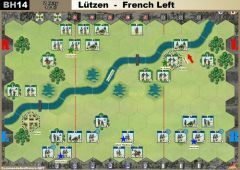 The Allied battle plan envisioned crushing the French right flank and then rolling up the French line. Around 8:00 AM on December 2, the first Allied columns began hitting the French right near the villages of Telnitz, Sokolnitz and the castle. 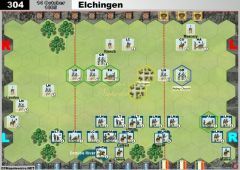 Taking the villages, they threw the French back across Goldbach Stream. The French, led by Davout’s corps, counterattacked successfully. 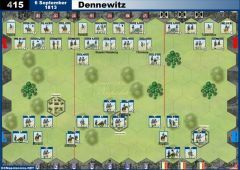 The Allies drew off most of their strength in the center to regain the initiative, and fighting around Sokolnitz raged throughout the day. Around 8:45, believing that the Allied center had been sufficiently weakened, Napoleon summoned Soult to discuss an attack on the enemy lines atop Pratzen Heights. Stating that “One sharp blow and the war is over,” he ordered the assault to move forward at 9:00. Advancing through the morning fog, General Louis de Saint-Hilaire’s division attacked up the heights and was thrown back after bitter fighting. Charging again, they managed to capture the heights. To their north, General Dominique Vandamme’s division defeated Allied forces around Staré Vinohrady. Napoleon moved his command post to the heights and ordered Bernadotte’s I Corps forward. Belatedly the Allied leaders realized the danger they had created by emptying their center of troops. 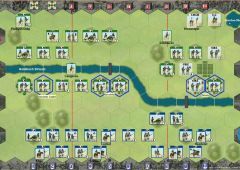 They recalled troops from the right, but at this critical moment, all that stood between the Allies and disaster was the magnificent Russian Guard Infantry and Cavalry that now stormed forward toward Vandamme. 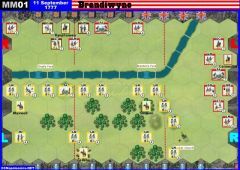 Their attack would have destroyed the division of a lesser general, but Vandamme held on grimly even when his left flank was crushed. The Allies had no reserves to exploit their success. Unfortunately for them, the French did. Bernadotte, on his own initiative, sent a fresh division, and Napoleon dispatched his Guard Cavalry, including the incomparable Grenadiers a’Cheval. The reduced and disorganized Russian Guards were swept away and the Allied center ceased to exist. 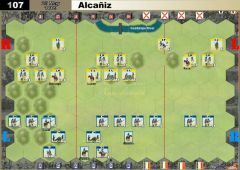 At the northern end of the battlefield, fighting began as Prince Liechtenstein led Allied cavalry against General François Kellermann’s light cavalry. 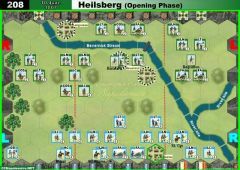 Under heavy pressure, Kellermann fell back behind Lannes’ infantry who blocked the Austrian advance. 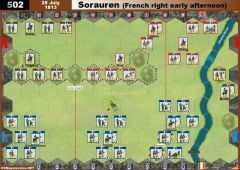 After the French finished off the cavalry, Lannes moved forward against Prince Pyotr Bagration’s Russian infantry. Engaging in a hard fight, Lannes forced the Russians to retreat from the battlefield. To complete the victory, Napoleon turned south and directed St. Hilaire’s division and part of Davout’s corps in a two-pronged attack on Sokolnitz that enveloped the Allied position. The Allied left collapsed. Those formations that did not surrender dissolved as the survivors fled en masse. • The 6 hexes that make up Pratzen Heights form a Temporary Majority Group Victory Banner worth 2 banners for the side that occupies an absolute majority at the start of its turn. The Allies start with 2 Victory Banners. • The 5 hexes that make up Stare Vinohrady (old vineyards) form a Temporary Majority Group Victory Banner worth 2 banners for the side that occupies an absolute majority at the start of its turn. The Allies start with 2 Victory Banners. 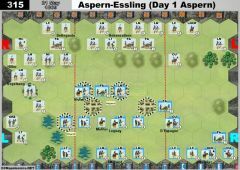 • The 6 town hexes of, Bosnitz, Blasowitz, Pratzen, the Castle (Walled Farm), Sokolnitz and Telnitz, form a Temporary Majority Group Victory Banner worth 3 banners for the side that occupies an absolute majority at the start of its turn. The French start with 3 Victory Banners. • The Goldbach and streams are fordable and do not stop movement. 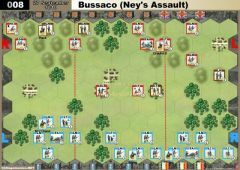 Battling out is at –1 die, battling, into no reduction. It´s not clear, which terrain hexes form the Temporary Majority Group for the "Pratzen Heights" and "Stare Vinohrady"
It´s a mistake in the scenario booklet. 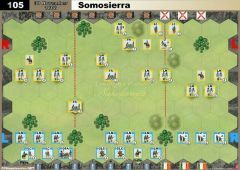 The Pratze Heights has 6 hexes and the Stare Vinohrady has 5 hexes in the La Grande Battle scenario. Mistake in the Vassal-Picture here. Thank you, yes I was talking about playing lgb with the core box and all the expansion. Unfortunately my friends don't have this game, so I will try to resolve this issue in a other way.. In Epic games you should have 1 box of each to play the scenarios. Played today. 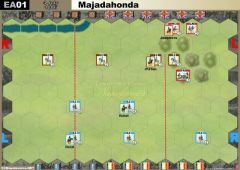 Excellent struggle that ended 22-17 to the French. Great intro to these massive battles.